Strapping Tools are some of the most important tools that you need around the warehouse or packaging area. 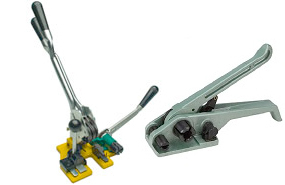 We also supply Strapping Seals and Buckles to compliment our strapping and tools. 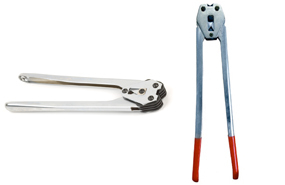 These quality tools help complete your strapping system. Our strapping seals and buckles are designed to keep plastic and steel strapping in place during shipping or moving around a warehouse. The Open Metal Seals are used for Plastic or Steel Strapping. They are sealed with a Crimper or Sealer for maximum hold. Our plastic and wire buckles are also excellent for securing plastic strapping. These buckles do not require a sealing method and are applied manually. 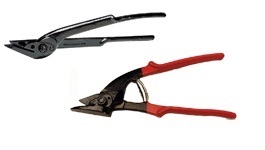 A strapping sealer or crimper is needed for application. Available for steel or plastic strapping. For heavy duty tensioning needs. Applications: Polypropylene, Poly Cord, Polyester, and Steel Strapping. No tools needed for Application. Applications: Polypropylene, Poly Cord, and Polyester Strapping. Does not tarnish or rust.